The horseback riding tour enables you to truly become one with nature; there are only the rider and the horse- a rest for the soul and the body. After the pick-up in front of the hotel where the guests are situated, they arrive at Kojan Koral. A guide is present during the entire tour. After the guests and the guide get acquainted, the guide provides the guests with their safety gear and introduces them to their horses, and presents the fundamentals of horseback riding. The tour is safe also for beginners and people who are riding for the first time, because the trail is not demanding, and the pace is slow in order to enable absolute peace of mind. 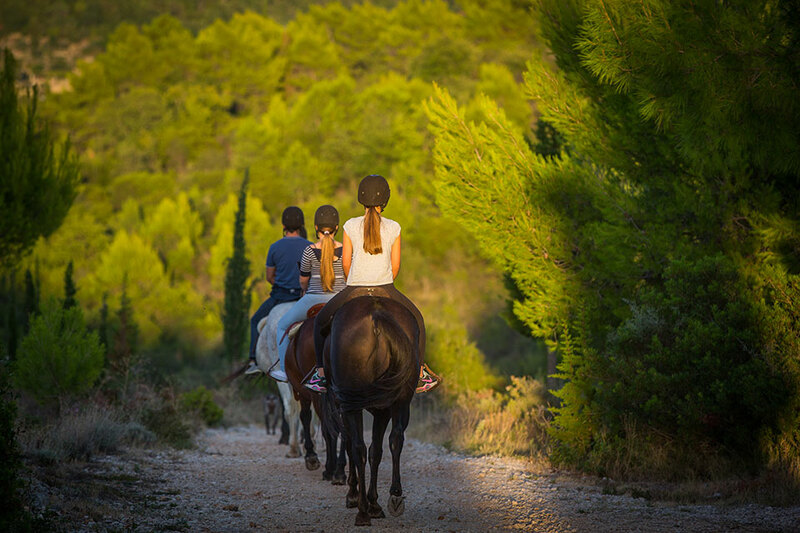 The riding tour itself takes two hours during which the guests ride through unexplored forest paths, along the Konavle rocks coastline, entering the preserved archaeological residues of the village Popovići while experiencing the beauty of Konavle. Upon their arrival, they are welcomed with a snack in a romantic environment. Maximal number of people is 6.